Enjoy pure and raw honey, full spectrum hemp extract with naturally occurring CBD, and tangerine organic essential oil in our 10 pack of Tangerine Tranquility sticks. We have paired pure and raw honey with Colorado grown full spectrum hemp extract to create a superfood of the highest quality. The addition of organic mandarin orange essential oil supercharges you with additional antioxidants and anti-inflammation qualities and helps to lower blood sugars. These infusions create synergies that surpass the benefits of consuming each food individually. • 100% pure and raw Rocky Mountain honey. • Colorado grown full spectrum hemp extract (plant based, non-isolate). • CBD is naturally occurring in hemp and with our full spectrum extract you get so much more than just CBD. • Naturally occurring cannabinoids, terpenes, and phytonutrients from hemp. • The hemp is extracted with a unique, reusable process that best preserves terpenes and maintains superior quality. • Triple tested for purity and potency. • We donate 10 cents of every purchase to Veterans to Farmers. • Each 10 pack contains 150 mg of full spectrum hemp extract. 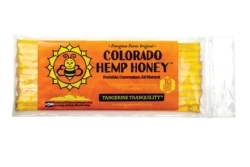 • 10 Colorado Hemp Honey sticks per pack: 10 servings, 15 mg hemp extract per serving (approximately 1 tsp). • Start with one serving and wait 30 minutes before consuming another serving to gauge how your body metabolizes the honey and cannabinoids.